It’s time to introduce a REAL muscle and performance car. From horsepower to exterior and interior styling, the Dodge Challenger SRT Hellcat is built for performance. With a little help from the Street and Racing Technology (SRT) team and the American muscle genius styling of Dodge, the Challenger SRT Hellcat is the most powerful and fastest muscle car ever. The 2016 Dodge Challenger SRT Hellcat has one of the most powerful engines on the market making it a competitor even with the most high-end performance sports cars. Unlike the other nine Challenger trims, the Challenger SRT Hellcat is powered by a Supercharged 6.2-liter HEMI SRT Hellcat V8 engine. This baby generates 707-horsepower and 650 lb-ft of torque, which is 7 more horsepower than the Lamborghini Aventador. The Dodge Challenger SRT Hellcat comes standard with 6-speed manual TREMEC transmission, but buyers have the option of a TorqueFlite 8-speed automatic HP90 transmission. When equipped with the automatic transmission the Challenger SRT Hellcat has a top speed of 199 mph, and it can accelerate from 0-60 mph in the low 3-second range. Additionally, the Challenger SRT Hellcat has a National Hot Rod Association (NHRA) certified quarter mile elapsed time in 11.2 seconds. Built for speed and power, the Hellcat has a fuel economy that is pretty standard of performance cars. The Challenger SRT Hellcat gets an average of 13 MPG in the city and 22 MPG when driving on the highway. To manage all of the power and give drivers maximum handling, the Challenger SRT Hellcat has a specially-made SRT-tuned three-mode Bilstein adaptive dampening system. This suspension has three modes including a Street Mode for a sporty but compliant ride, a Sport Mode for firm handling and a Track Mode for maximum handling plus performance shifting and gear holding. 46 years after the Dodge Challenger’s first production in 1970, and the Challenger still has a look that is reminiscent of its original design. As a performance car, all aspects of the exterior are built for maximum results. One of the Challenger’s most iconic design elements is the square front grille with four round headlights, but both of these traits have unique design functionality to help increase the Challenger’s air intake. The four headlights double as lighting, however, the driver’s side parking lamp is actually hollow. This was done to enable an Air Catcher cold-air intake, helping the the engine deliver horsepower and torque.The Challenger SRT Hellcat’s gloss-black grille has massive air scoops and a high-flow front fascia both of which help to maximize airflow and engine cooling. To ensure safety and control, the Challenger SRT Hellcat is equipped with sturdy tires and an excellent performance braking system. The Challenger SRT Hellcat rides on SRT matte black lightweight forged aluminum rims, Pirelli all-season performance tires, accompanied by large Brembo performance brakes. The brakes are 15.4-inch Brembo two-piece rotors with six-piston calipers. They offer optimum heat management, thermal capacity and longevity. The Challenger SRT Hellcat can comfortably seat up to five people, and as the top-notch Challenger trim, the interior is fitted with high-end finishes. 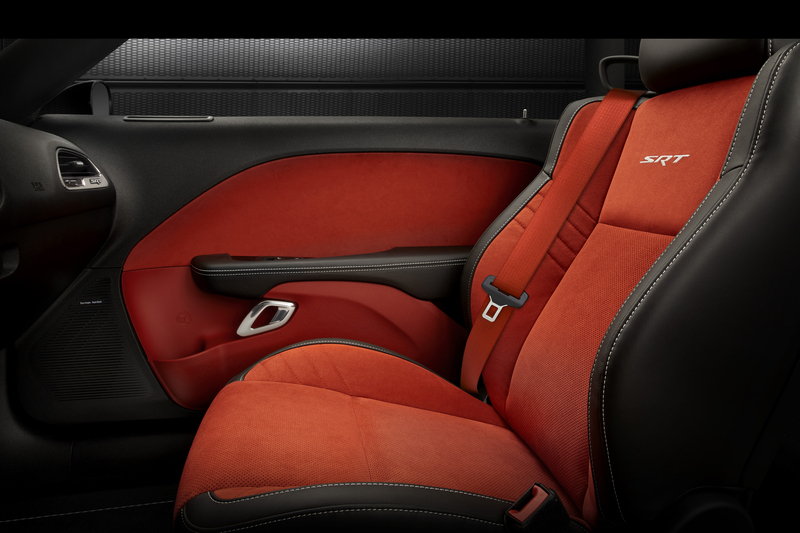 The Challenger SRT Hellcat features premium laguna SRT leather seating and the front two seats have heating capabilities for chilly nights and ventilated seats for hot summer days. The Challenger SRT Hellcat has an 8.4-inch touchscreen display, where drivers can activate the ‘Launch Control’ feature, which helps to enhance performance at every level or the Uconnect 8.4 with GPS navigation system. To ensure drivers can clearly hear the music over all of that horsepower, the SRT Hellcat is fitted with 18 speakers with a subwoofer. The SRT Hellcat has advanced multistage front airbags along with supplemental front seat-mounted side airbags and side-curtain front and rear airbags, providing safety for all of the passengers. The vehicle is also fitted with active head restraints, blind spot and rear cross path detection, electronic stability control, rain brake support, and rain sensitive windshield wipers in case of sudden weather change. For additional security, the car comes with a ParkView rear back-up camera and a ParkSense rear park assist system. 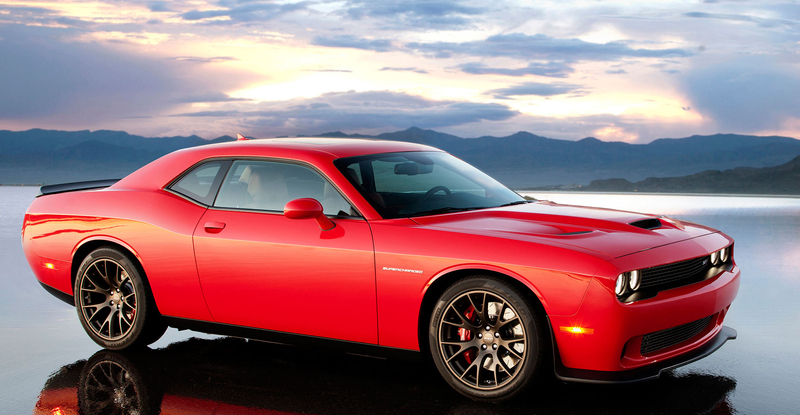 The Dodge Challenger SRT Hellcat has an MSRP of $64,195. It is the most expensive of the Challenger trims, but also comes with the best features and one of the most powerful engines in the automotive world. All Dodge vehicles are backed with a basic limited warranty of up to three years or 36,000 miles, along with five years or 60,000 miles of protection on the vehicle’s powertrain. There is also five years or 100,000 miles of complimentary unlimited roadside assistance. Where can you get a Dodge Challenger SRT Hellcat? You can find the SRT Hellcat and other Dodge Challenger cars at Aventura Chrysler Jeep Dodge Ram located in North Miami Beach near Aventura, which is a central neighborhood in north Miami. You can view our online inventory here, or come visit us for a test drive today.